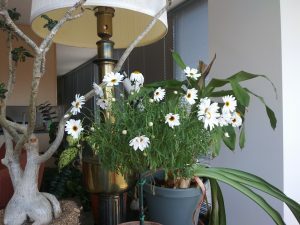 What is often called a daisy tree is a Marguerite that has been trained to grow as a single stem. 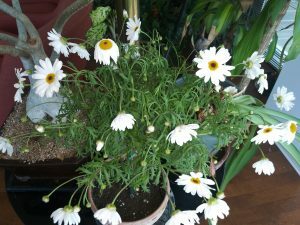 Marguerites belong to the Daisy family and are perennials that grow in the form of a shrub. They are grown mostly in the southwestern United States. In 2 to 3 years, a seedling can be trained to grow like a tree. This can be accomplished by removing all the buds that form on the stem, and then pinching the top of the stem when it’s reached the correct height. By the second year the stem will have become brown and woody, and all of the growth will be pushed toward the top. To keep the shape, prune some stems back to the crown, and pinch alternate stems back by one-third to one-half. New stems will develop from buds remaining on the stems. Remove any buds that grow on the upright “trunk” of the plant. Marguerites like full sunshine and regular watering during the summer, and greenhouse protection in the winter months. The tops are susceptible to frost damage and the entire plant will die if left outdoors when the weather gets cold. I read on the Internet, that it’s not a good candidate for indoor growing because the intensity of light during the wintertime is too low in the average household. The plants are great for seasonal color in the summertime, but unless you have a greenhouse, it will be difficult to keep it year after year. I have realized that people who try to sell these plants often fail to mention that they don’t make good houseplants. Both at the flower show, and also at a local garden center, I specifically asked whether this type of plant could live indoors, and at both places I was told that it could. This just goes to show that very often sellers will mislead you just to make a sale. This is why it’s often a good idea to do some research on a plant before making a purchase. I bought the plant in the pictures above at Gethsemane Garden Center in Chicago for $24.99. I was told when I bought it that it would live indoors, but now based upon what I read on the Internet, I’m starting to doubt whether or not it’s going to live until next year. I don’t know if I will be able to provide it with adequate light during the winter months.